Season roast well with salt and pepper. In a medium saute pan over medium-high heat, add 2 tablespoons oil. When hot, sear roast on all sides, until nicely caramelized, about 8 to 10 minutes. Remove roast to a sheet tray lined with a wire rack. Meanwhile, place garlic, parsley, thyme, oregano, rosemary, mustard powder, 1/2 cup oil, salt and pepper, to taste, in a food processor and pulse until mixture forms a paste. Rub paste all over roast. Bake in the oven until the roast is cooked to medium-rare or registers 125 degrees F on an instant-read thermometer, about 45 minutes. 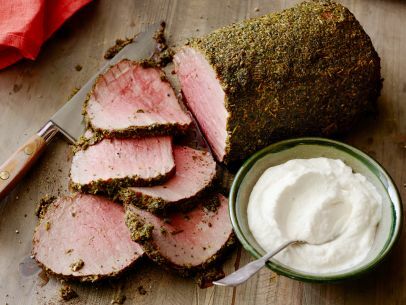 Let roast rest 10 minutes before slicing and serve with Horseradish Cream. In a small bowl, mix together all ingredients. Cover and refrigerate until ready to serve.